The deep depression in the Bay of Bengal on Tuesday further intensified into cyclonic storm ‘Kyant’, the India Meteorological Department said. “The deep depression over east central Bay of Bengal moved further west-northwestwards and has intensified into a cyclonic storm ‘KYANT’ and lay centred at 620 km north-northwest of Port Blair, 710 km south-southeast of Gopalpur and 850 km east of Vishakhapatnam. “The system will move initially west-northwestwards and then west to west-southwestwards towards west central Bay of Bengal during next 72 hours,” the cyclone warning division of the IMD said. However, there is a possibility that Kyant may not make a landfall. 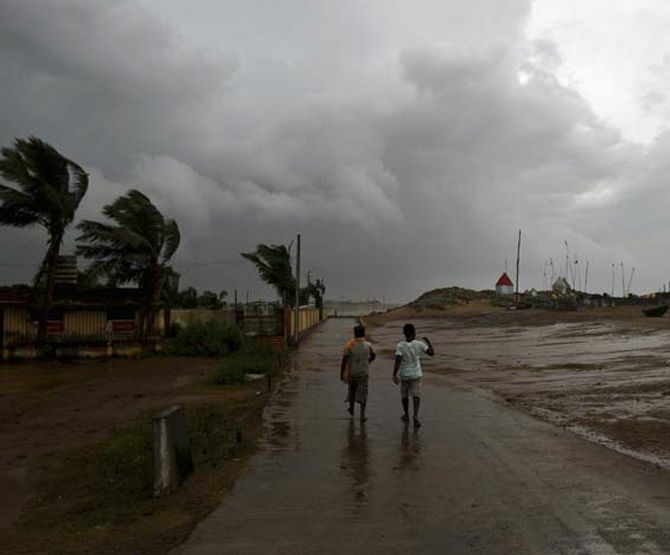 The IMD has warned of squally winds speed reaching 45-55 kmph gusting to 65 kmph likely to commence along and off Odisha and north coastal Andhra Pradesh coasts from October 27 onwards. Fishermen too are advised not to venture into sea along and off Odisha and north coastal Andhra Pradesh coasts. The government has also put the collectors of 14 districts on high alert. The directions to collectors in coastal, northern and southern districts were issued by Chief Minister Naveen Patnaik through video-conferencing while reviewing the preparedness. The collectors have also been asked to keep the harvested crop covered as rain is expected under the influence of the cyclonic storm. FAQ: What's a cyclone; how destructive can it be? What are the chances of a natural disaster striking India?